Amyloids are clumps of protein fragments that stick together to form stringy fibrils such as the plaques seen in the brains of Alzheimer's patients. Many of these proteins bind to metals such as zinc, but the structure of these metal-bound proteins has been difficult to study. The importance of these metals to the activity of amyloids thus remains an open question, which is all the more perplexing because some amyloids are associated with disease but others are not. 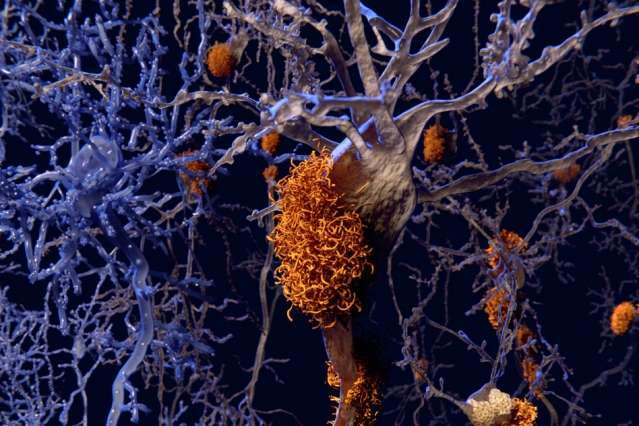 A team of MIT chemists, working with researchers at the University of California at San Francisco (UCSF) and Syracuse University, has now deciphered the structure of an amyloid that binds to zinc. Their approach, based on nuclear magnetic resonance (NMR), could also be used to reveal the structures of additional metal-bound amyloids. "Even though there has been a lot of high-resolution, atomic level structural work on amyloids by solid-state NMR, people have really not studied the metal-binding aspects," says Mei Hong, an MIT professor of chemistry and one of the senior authors of the paper, which appears in the Proceedings of the National Academy of Sciences the week of May 29. Researchers at UCSF and Syracuse designed the amyloid protein to catalyze a specific reaction: combining carbon dioxide and water to form bicarbonate. The newly discovered structure of the amyloid sheds light on how the protein performs this function and how zinc assists in the reaction catalysis. William DeGrado, a professor of pharmaceutical chemistry at UCSF, is the paper's other senior author. MT graduate student Myungwoon Lee is the lead author of the paper. While amyloids are often associated with diseases such as Alzheimer's and Parkinson's diseases, other amyloids have normal biological functions. The UCSF and Syracuse researchers first reported their artificial amyloid in 2014. Their goal was to produce a very simple metal-bound protein that could catalyze a chemical reaction necessary for life, in hopes of demonstrating that such simple metal-bound peptides could have been precursors to modern-day enzymes. In that paper, they showed that the peptide, which consists of seven amino acids bound to a zinc ion, could catalyze the conversion of carbon dioxide and water to bicarbonate as efficiently as the enzyme carbonic anhydrase, which performs this reaction in living cells and also requires zinc. "It is plausible for very small peptides that bear metal ions to do chemistry, and the evolution of enzyme activities may have started from these small peptides," Hong says. The UCSF researchers designed their peptide so that its active site, where the chemical reaction takes place, would mimic that of carbonic anhydrase, which has a zinc ion tethered to three chains of the amino acid histidine. However, they didn't know the precise structure of the fibrils formed by their peptide, which is where Hong and her MIT colleagues came in. To determine the structure, the research team used a two-pronged approach based on NMR spectroscopy and bioinformatics, which is a method of using computer algorithms to analyze biological data. Using NMR, the researchers first determined that the peptides form a long fibril chain that consists of layers of structures called beta sheets. Within each beta sheet, each peptide strand has two histidines that can interact with the next strand. Their next goal was to determine how the zinc ions fit into this multistranded and multilayered structure. NMR uses the magnetic properties of atomic nuclei to reveal the structures of the molecules containing those nuclei. In this case, the researchers used NMR to analyze signals from key nitrogen atoms in the histidine sidechains that interact with zinc ions. By comparing these signals when the amyloids were and weren't bound to zinc, the researchers determined that half of the histidines coordinate one zinc atom each, while the other half interact with two zinc atoms each. "The high concentration of histidines bridging two zinc ions is very unusual," Hong says. The researchers also used NMR to measure the angles of the bonds that allow histidine to interact with zinc, and then used bioinformatics to determine the possible structures consistent with those configurations. This revealed that one zinc atom sits between two amyloid-beta strands, and it is bound to one histidine sidechain from above and two from below. This forms a tetrahedral structure in which three histidine nitrogens hold the zinc in place while one histidine nitrogen remains unattached. The unattached histidine nitrogen is free to bind to a molecule of water, which is necessary to carry out the reaction catalyzed by the zinc ion. Hong's collaborators at UCSF have previously shown that this amyloid catalyzes bicarbonate formation at a rate similar to that of carbonic anhydrase, supporting the theory that this type of simple amyloid could have been used by early life forms to carry out important reactions. Hong now plans to begin studying the structure of metal-bound amyloids involved in neurodegenerative diseases. The amyloids involved in both Parkinson's and Alzheimer's diseases have been shown to bind to metal ions, including zinc and copper, but how these metals influence the diseases is not known, nor have their structures been determined. "There have been some molecular dynamics simulations to guess how metals bind these histidines, but there has been no high-resolution, atomic-level investigation of the coordination structure," Hong says.